Lovely stretch lace accented with rhinestones. Please allow an extra day to process your order if you choose a gift wrapping. Beautiful! I took the set in gold! Came right away in good condition! Very help, Great experience. It is the same as picture describes! 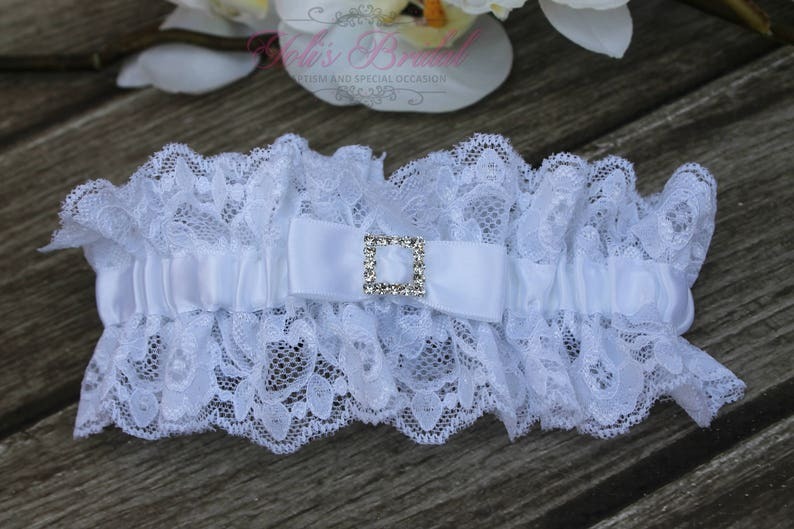 As is standard in the bridal industry, due to the delicate nature of our products, all sales are final. We implement the highest standards of quality control before shipping to make sure everything is in perfect condition so that you get a really perfect piece. We are very honest and will not be happy if you are not. Please notify us as soon as you receive your order if there is any problem with it, and we will do our best to work out a solution. Please feel free to ask questions or request more information before your purchase. We are always here to help you! All orders are shipped via USPS. Most but not all of our products are shipped within 2-3 business days, but please refer to individual product for an exact date, as some of them can take longer. USPS Standard First Class shipping will take 4-5 business days plus the processing time of 1-3 business days. USPS Priority Mail is 2-3 business days plus the processing time. USPS Priority Mail Express is 1-2 business days plus processing time. NOTE that business days are Monday trough Friday. Priority Mail and Priority Mail Express are shipped with a tracking number and insurance, so you can make a claim with the USPS in case a package is lost. Please understand that once your order leaves our shop, we have no control over USPS shipping. Please ensure that your address is correct before you place your order as we are not responsible for a delayed or lost package. No refunds will be given for packages that we mailed out on time yet not delivered by the USPS on time. ***If your order is not delivered, please contact your local post office with your tracking number. We are not responsible for losses or delays caused by the USPS. Again, please verify your address when checking out. Although we can work with you to locate your package we are NOT responsible for USPS errors. International orders varies depends on your Country and Customs. Average business days for delivery are 7 to 21. But there're countries that may take up to 6 weeks. Yoli's Bridal is not responsible for customs delays or lost packages. If for some reason your tracking shows delivered and you have not received your package. We request that you check with your post office first and please verify that your current mailing address is the address on the order. Once a package leaves my hands I don't have any control over it, so you will need to make a claim and/or contact your local post office if you didn't receive your package.